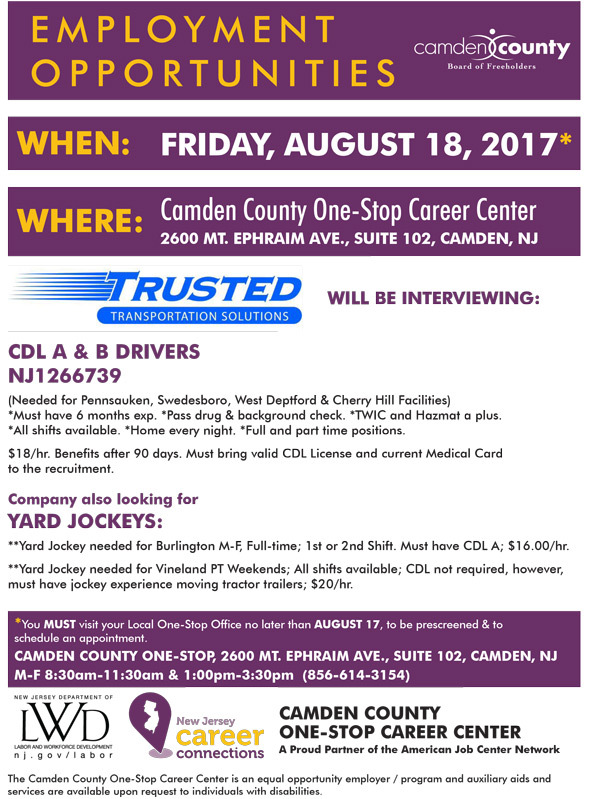 Trusted Transportation Solutions will be holding a Recruitment Event on Friday, August 18, 2017 at the Camden County One-Stop Office, 2600 Mt. Ephraim Ave., Suite 102, Camden, NJ. ALL candidates MUST be prescreened and scheduled for an appointment prior to the recruitment date by their Local One-Stop Office. Visit your local One-Stop Office NO LATER THAN August 17 to be prescreened and to schedule an appointment. One-Stop Hours are Monday through Friday, 8:30 AM – 11:30 AM and 1 PM – 3:30PM.